Who are / is some of your favourite TMNT villains ?! Just wanted to say this is a really great idea and thanks for offering this to us. I would like to know. If you had the opportunity to have the turtles do a crossover with any comic character/s who would you choose?" There are quite a few intriguing possibilities for fun crossovers. 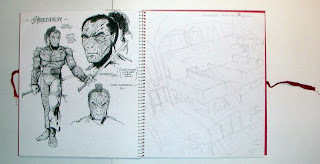 Just as I was typing the above, I started thinking about characters from other comics who would get on well with individual Turtles, and I got this vision of Donatello and Tony Stark (aka Iron Man) collaborating on some techy project... and now I have this image in my head of Donatello in an Iron Man-style armored suit! (Yes, I know "tiny Don" in the current Volume 4 continuity is using a modified robot body to get around in, but that's very different.) 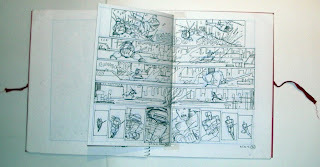 Actually, if memory serves, I think Kevin and I may have drawn an "Iron Turtle" way back when. I'll have to see if I can dig that one up. After reading your comments regarding your reasons behind redoing the early issues of Volume 1 in Volume 4 issue 29, I can definitely understand why you want to redo them. It's clearly your personal preference to give them an updated toning and look, while redoing some of the wording. But I was wondering if there is any chance you'd be willing to reprint copies of the original version in a separate collected trade at the same time as the new retoned trades? I know I'd end up buying both and I'm sure I'm not alone in that. 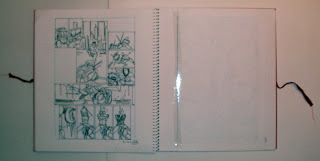 However, I just think printing both styles would give your fans the ability to purchase the style they prefer. What is your opinion on that kind of compromise with the fan base?" 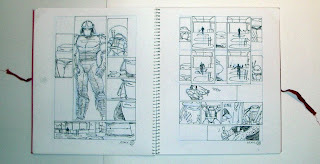 Although I am continuing (albeit at a frozen snail's pace) the "remastering" project, and hope to have enough done to facilitate reprint collections of most of the Laird/Eastman Volume One material, I have never ruled out reprints of the original material with the original tones. 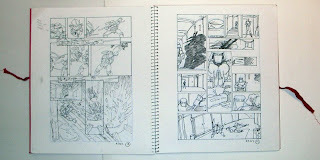 In fact, a few months ago I had exactly the idea you suggested -- releasing the two versions simultaneously. That is definitely a possibility. "Also, can we please get a City at War trade printed? It is long overdue. " 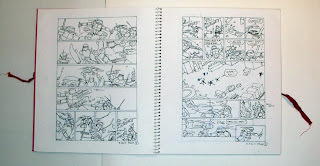 As I have said in the past, there will be a "City at War" collection, as well as a "Return to New York" collection, at some point -- perhaps during our 25th anniversary year. "Finally, echoing Rose, what are the plans for the turtles after your retirement?" 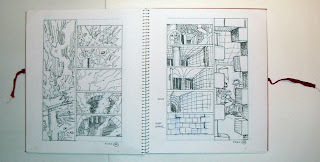 That's it for the layouts for the comic book pages. 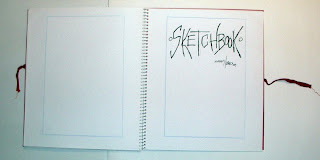 The following images are from a proposed "Sketchbook" sction which never made it into the comic book. 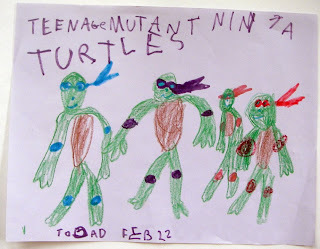 Because one of my reasons for beginning my blog was to establish a new avenue of interaction between me and Internet-enabled TMNT fans, I thought that it might be worth occasionally trying to answer questions directly via this blog. Here's how I'm thinking it might work: If you have any questions you'd like to ask, post them in the "Comments" section of this blog post. 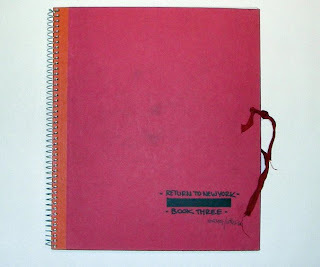 I'll look them over, and pick one or more of the most interesting, and use it or them as the basis for a new blog post. 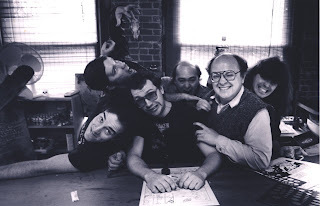 This is another photo from that day in the old studio, with me and the guys getting a little wacky. This is a drawing I found stuck with a magnet to the side of my file cabinet. I know there was a reason I drew this -- I just can't remember what it was right now. Maybe I have it written down somwhere. I was cleaning up a little bit in my incredibly messy office and came upon this little gem. I love this photo! 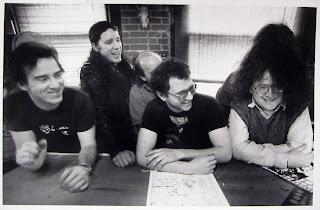 I think our old friend Fred Moore took it in the old cutlery building studio. It's funny what you can find when you're looking for something else. I was going through some big manila folders the other day looking for a particular piece of artwork, and stumbled on something I had forgotten. 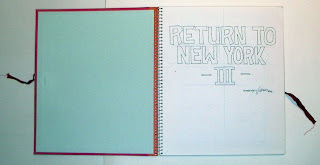 It's a book of layouts for the third issue of the "Return to New York" three-part arc in the original Volume 1 "Teenage Mutant Ninja Turtles" comic. 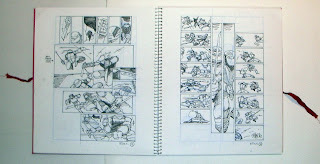 What's particularly curious about this artifact is that these layouts contain roughly equal parts me and Kevin -- we had decided that, after he laid out the fist RTNY book and I laid out the second one, we would share the duties on this third issue. 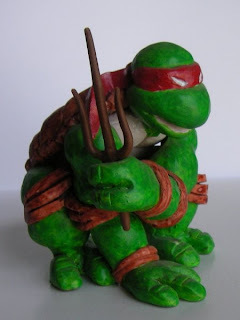 The way we did it, as I recall, is that he would focus on the Leo vs. the Shredder stuff and I would deal with the other Turtles in their battle with the Shredder mutants and the rest of the Foot. 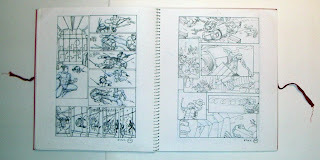 I actually have no clear, specific memories of how we worked on this book of layouts, but it would appear that once we had agreed on the plot, and worked out which pages would deal with which scenarios, we passed this book back and forth between us and drew in it those layout designs that we came up with. 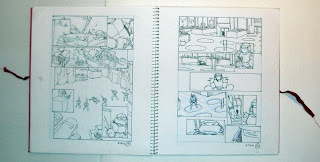 (I suspect that I had done even rougher thumbnail layouts on some other pieces of paper somewhere -- maybe someday I'll stumble on those too). 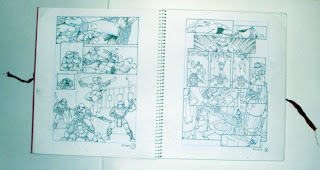 Once this was done, these layouts were passed to Jim Lawson, who went ahead and did the full pencils (and did a great job on them, I might say), which Kevin then inked. Here's another cool sculpture gift, this time from the talented digits of Ryan Brown. 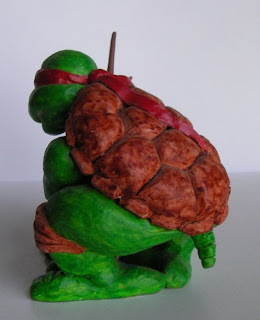 I have several sculptures that Ryan made for me, but I believe this was the first one, and may have been one of his first experiments with Sculpey. I see Ryan's drawing style all over this sculpture. He really did a great job on the crouching pose, didn't he? 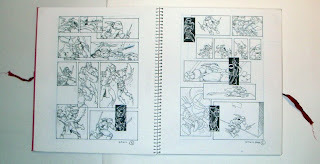 Over at Ryan Brown and Steve Lavigne's "Cowabunga Cartoon Classics!" blog (http://lavignebrownart.blogspot.com/), I noticed a photograph of me and Kevin from the old days with a piece of art blown up in the background. 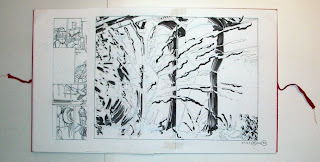 There were some questions about what that art was, and I tracked it down... or at least one version of it. My memory is a little iffy about the precise details, but I believe this is a piece that I penciled and inked, and then Michael Dooney did a painted version over my inks. Then I did my own color version (shamelessly copying Mike's beautiful rendering of the metallic reflections on the Fugitoid's body). 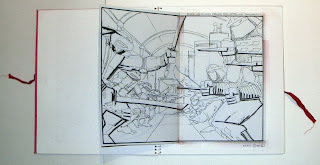 I found this version in a folder of files I was originally going to put up on my "Blast From The Past" page on the planetracers.com website. Why did I do my own version after Mike did his? I don't exactly recall. 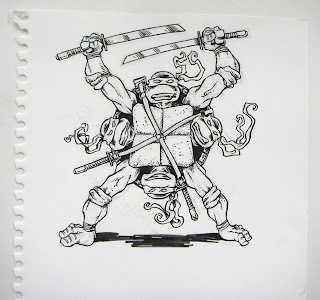 But in the notes I left in the folder in which I found this piece, apparently it was created as a cover for one of the First Comics graphic novel reprints of the old TMNT books... and was rejected. One of the frustrating things for me about going to comic conventions -- especially large, busy ones -- is the fact that I meet all kinds of nice people, talk with them, shake their hands... and then promptly forget their names. I've never been good at remembering names and/or faces from first meetings, and it's even more difficult for me at shows, where there are so many people in such a short span of time. At the recent NYCC, I was given three neat pieces of artwork, and, true to form, I totally forgot the names of the people who gave them to me. But I'd like to share them with you, and hopefully the folks who gave them to me might see them and let me know their names so they can have due credit. 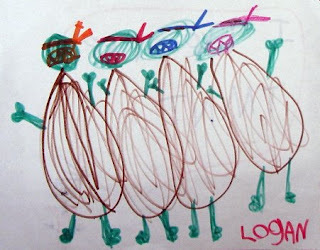 This one is a cute little kid's drawing of the four Turtles (reminds me of a few my daughter did when she was very young). 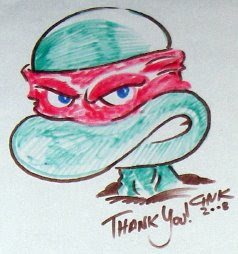 This Turtle head sketch reminds me somewhat of my father's cartooning style. 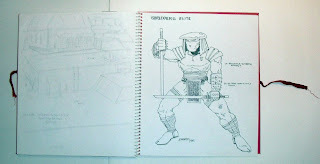 I've been thinking about things that would be fun to do for the twenty-fifth anniversary year of the TMNT, and, while I was out in my studio a few days ago, I saw something that inspired me. 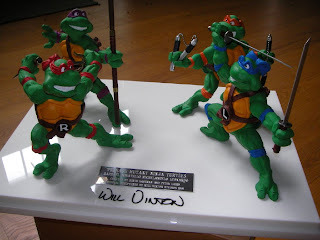 This is a set of hand-painted castings of the sculptures done by the famous (and justly so) master of clay animation, Will Vinton, for a very cool animated commercial for a product which was called (if memory serves) "Pizza Crunchabungas". (Actually, I'm FAIRLY sure Will Vinton did the sculpting, but I could be wrong -- it might have been someone else working for his studio.) 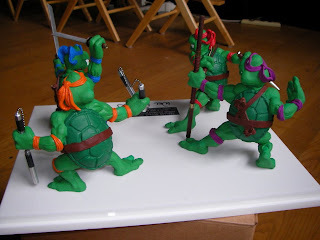 I had long been a fan of "claymation", as it was called, and it was a true thrill to have a TMNT product advertised with this technique. I really like these. 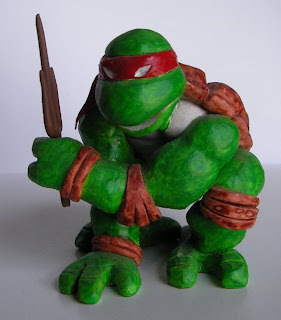 The sculpting is a wonderfully energetic take on the look of the TMNT as established in the first TMNT animated show and toy line, and the poses are dynamic and fun. Looking at these things again got me thinking -- would there be enough interest out there to release facsimile replicas of these? I talked about it with Mirage CEO Gary Richardson, and he has begun the process of tracking down and talking to the right people. Well, here I am, doing a blog. 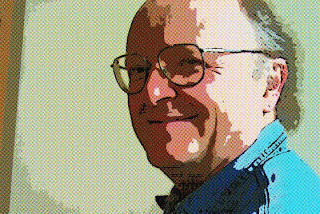 I've been thinking about it for a while, watching what my wife does with hers and friends like Steve Murphy does with his "5th Turtle" blog, and finally concluded that it's time for me to get my feet wet. 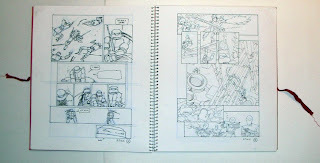 I suppose this blog will have a significant percentage of content related to the Teenage Mutant NInja Turtles, but I'll probably be going off on other tangents as well. What put me over the edge and pushed me to start this thing was something that happened at the recent signing we (me, Mike Dooney, Jim Lawson, and Dan Berger) did at the "That's Entertainment!" comics and collectibles store in Worcester, MA last Saturday. We were there from 11AM to 5PM, signing, sketching and chatting with fans. It was a good signing, much like the others we'd done at that shop (I think this was either our third or fourth time there). About half an hour before the end of our signing day, a young couple came up to our tables and started asking us questions. They were really nice folks (the kind of fans we love to meet, articulate and excited) and actually came up with some interesting questions. 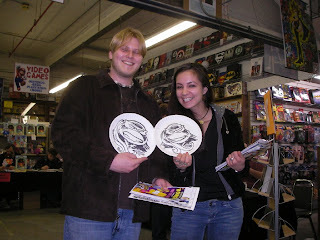 I found them both charming, and gave them a couple of head sketches I had drawn on some paper plates (left over -- unused -- from our pizza lunch). Then, just as we were packing up to leave, I also gave them one of the sets of the NYCC TMNT toys from NECA that I had brought with me, which they seemed happy to receive. extremely fun (and funny) to talk with as well. 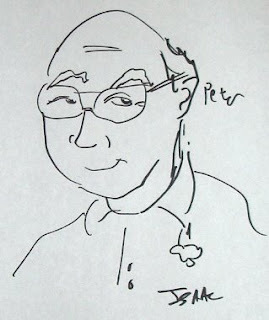 Peter, thank you so much for the sketches on the paper plates, and the turtles toy set. You really made our day (week, and year!) and put a smile on our face, and gave us memories to last a long time! into taking martial arts classes. Once again, we wanted to thank you for both your time and generosity! So how about that? Problem solved. I wrote back to them and asked for permission to use the email and the photo, and they graciously gave it. Nice people. P.S. 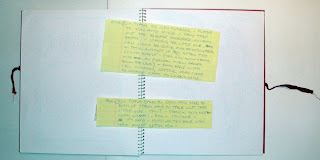 You might be wondering why I decided to call this blog "PALBlog". It's pretty simple, really -- it's my initials plus "blog". (I was having trouble coming up with a cool name, so I went with the basics.) But I also like it because it kind of reminds me of "Peblak", the name I came up with for the city in which the initial "Fugitoid" adventure was set. 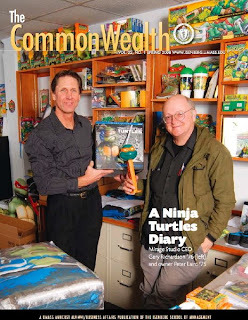 And -- for those who, like me, enjoy such trivia -- did you know that "Peblak" is an anagram of my and Kevin Eastman's initials?